Some weeks ago I posted teaser for an upcoming game. 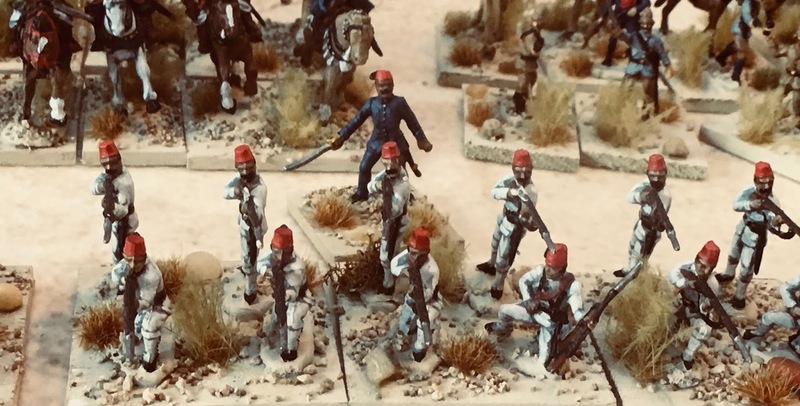 The post featured my The Men Who Would Be Kings (TMWWBK) Egyptian Army. We use approximately a double list from the rules for our colonial games and I have a number of house rules that provide flavor. 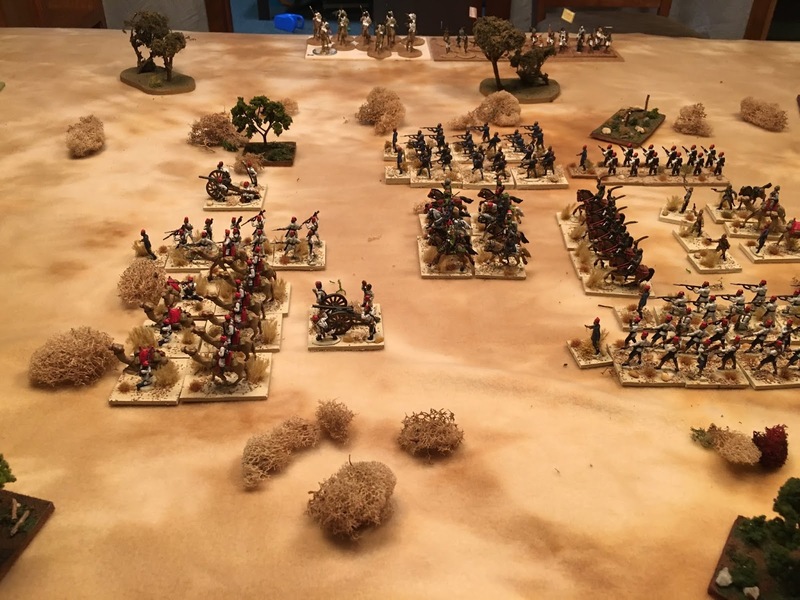 We finally got around to doing the game after numerous cancellations. My friend Jim brought over his excellent collection of Mahdists and we were ready to go. My friend Jim and my son Justin commanded the forces of the Mahdi with each of them having a Rub (pronounced Roob) each. The handicaps assigned to the Mahdists were variable leadership skills as the tactical level. (They had a number of units that turned out to be poorly led.) 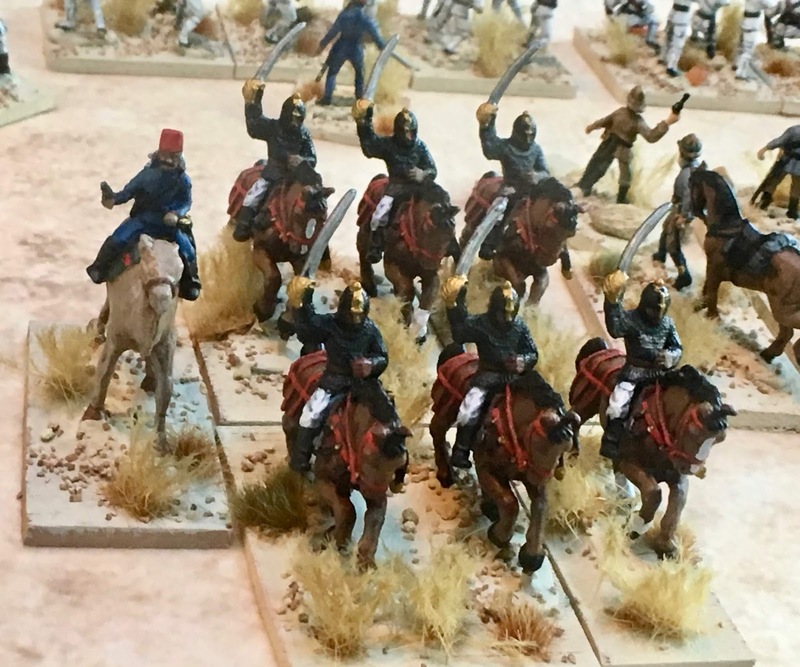 On a higher level the Mahdists only had two Rubs present at the start of the game while the other two had to be diced for. Since the remaining two were supposed to be deployed to the side of traveling Egyptian square the idea was to not make it too easy for all the Rubs to attack at once. 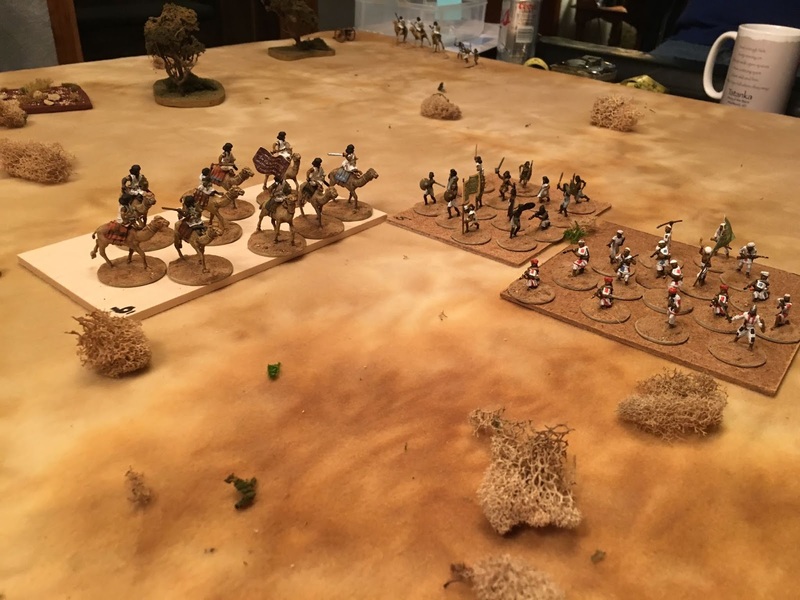 The Egyptian battle plan recognized that we had a little time so we elected to try and break through the Rub to our front before the other Rubs could effectively surround us. 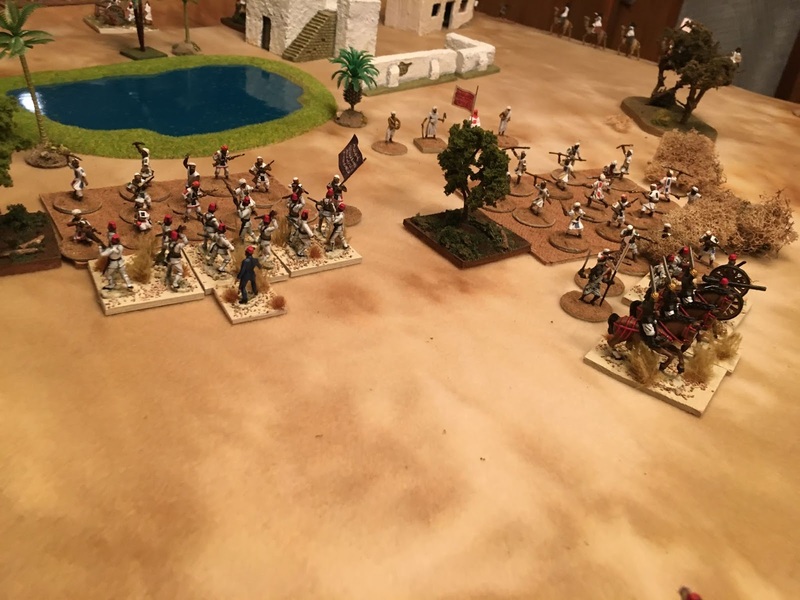 In addition to having sub-standard firing factors the terrain hindered the Egyptian line of sight. Historically the Mahdists were able to get very close to the Egyptians. 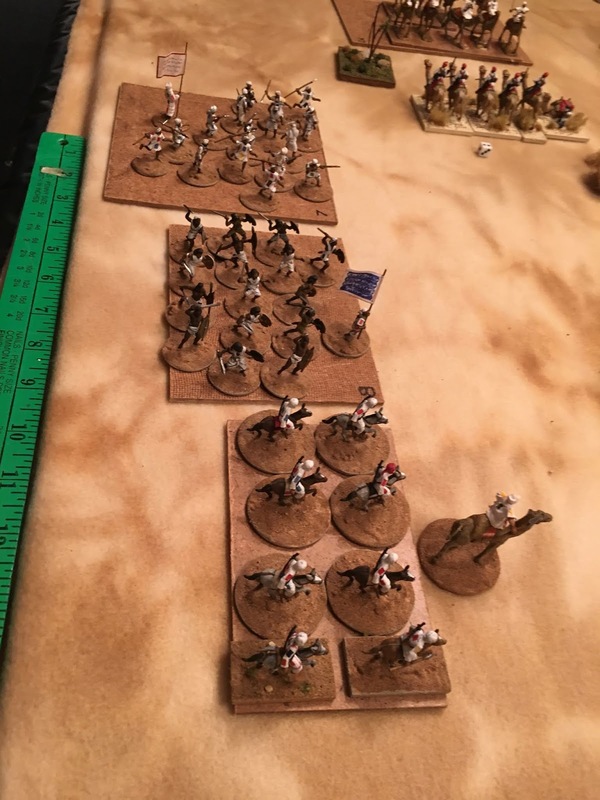 I reflected this advantage by making all the terrain of the type where it was difficult to sight the stealthy Mahdists. Never-the-less, Mike and I thought we had a chance to bull our way through. 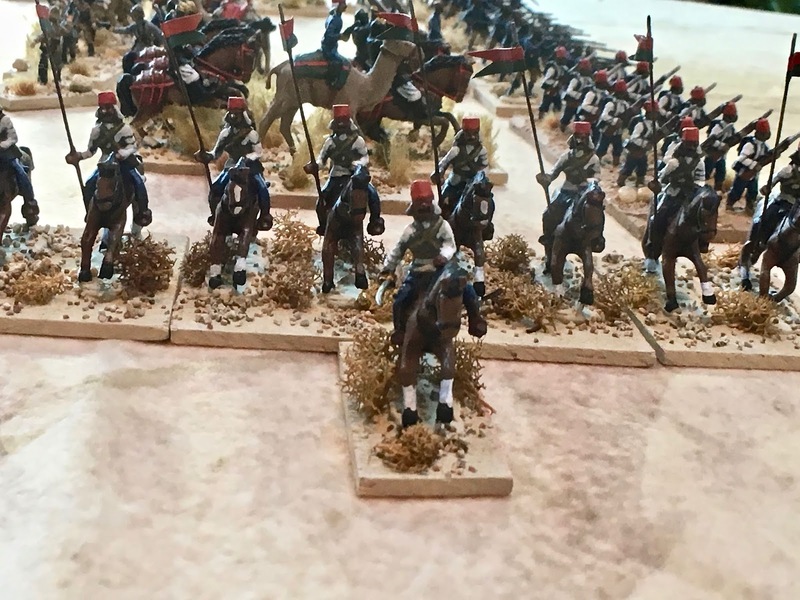 The pictures below are not in any particular order because it is hard to be a game master and take pictures and then get them in sequence with appropriate comments. 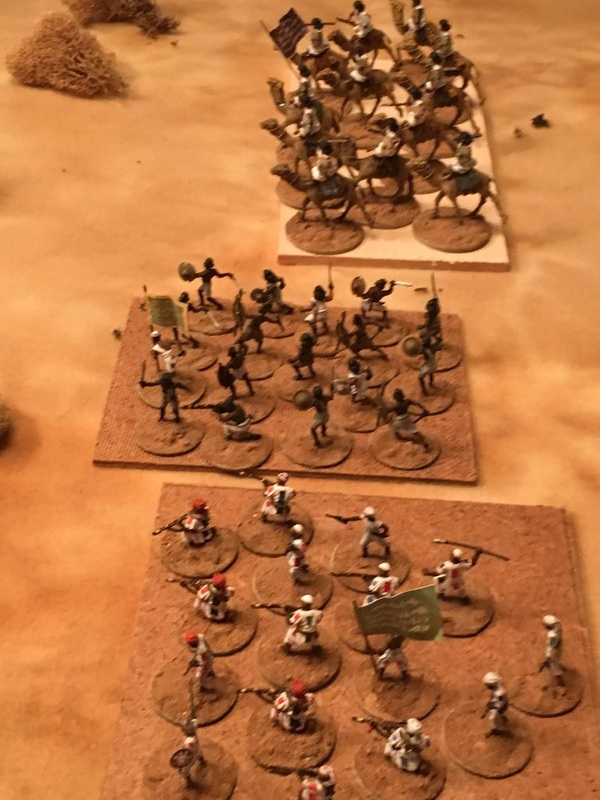 This pic gives a good view of the Egyptians trying to deploy to their front.The camel troops were supposed to outflank the Rub to their flank while the Bashi Bszouks (center of the picture) were to gain the other flank. Sadly, they failed to move in a timely manner and were destined to be destroyed by camel mounted Hadendowa. The two Krupp cannon were a mixed bag when firing. 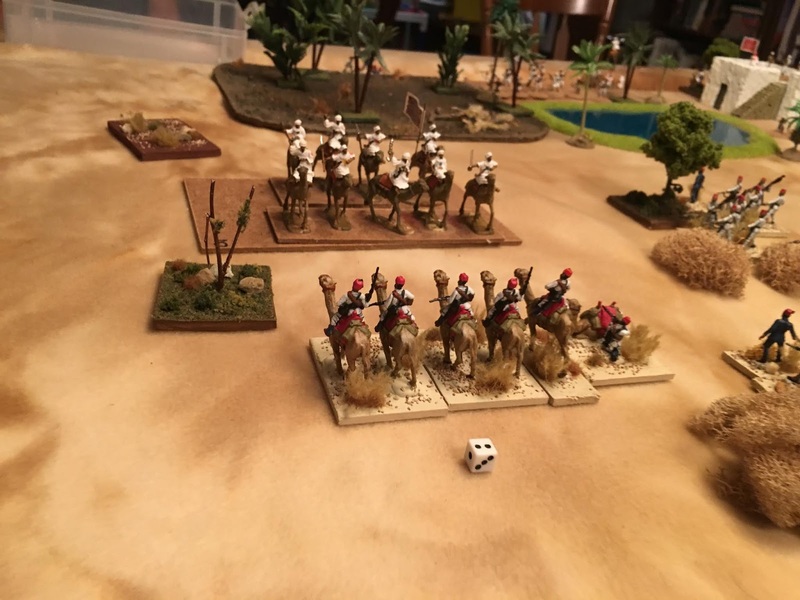 I made the rule where they had to dice to fire and half the time they failed (considered ineffective actually). When they did get to fire it was effective. 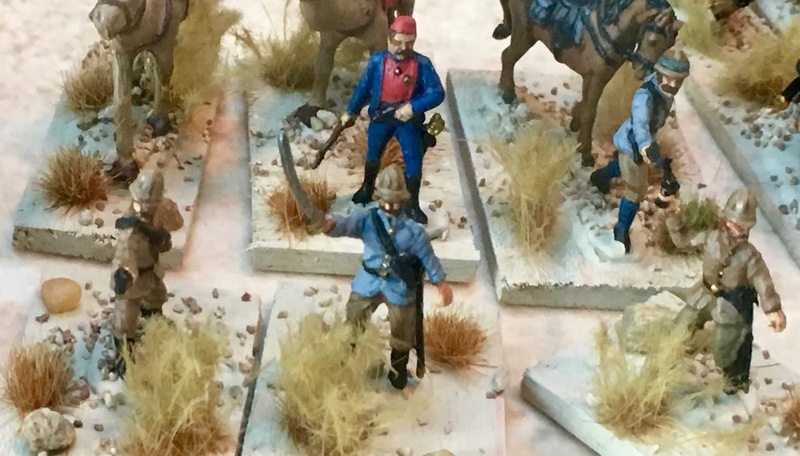 Close up of one of the flanking Rubs. 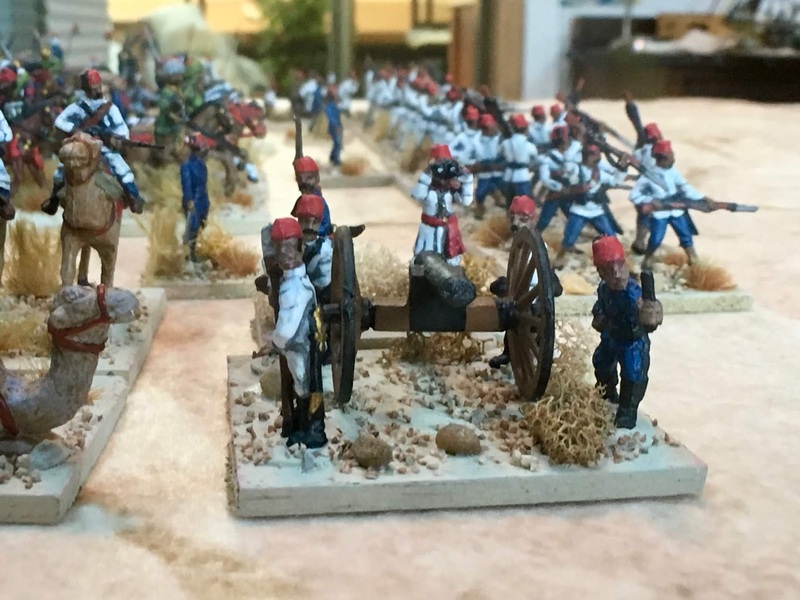 Two of the three units are the nasty Beja Hadendowa. The Green Flag Roob advances! 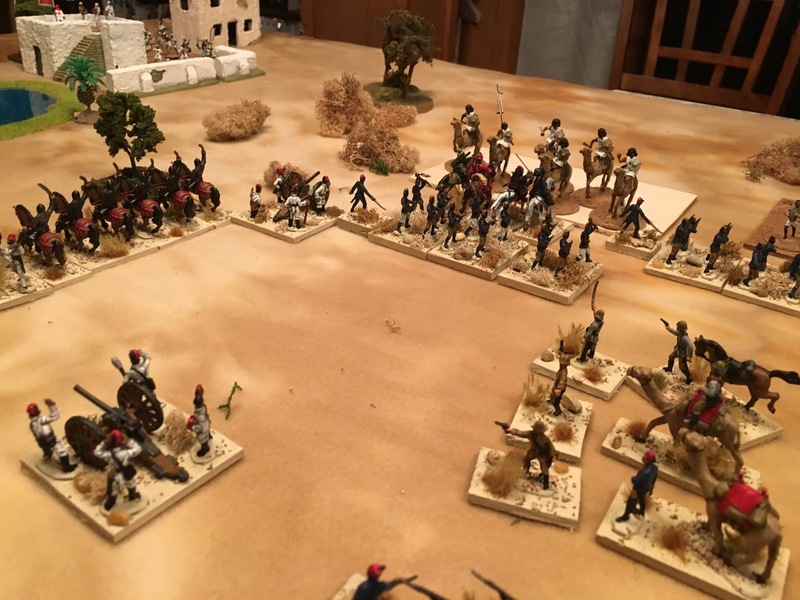 Egyptian forces try to form a square. Pasha Hicks and his staff try to direct a defense but it does not look good. 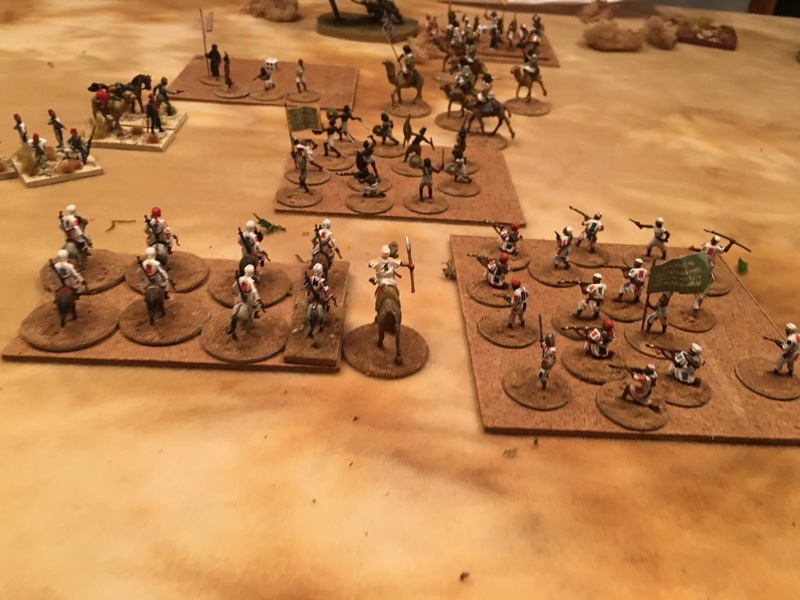 Pinned Egyptian camelry is about to be charged by Arab camelry and die valiantly! 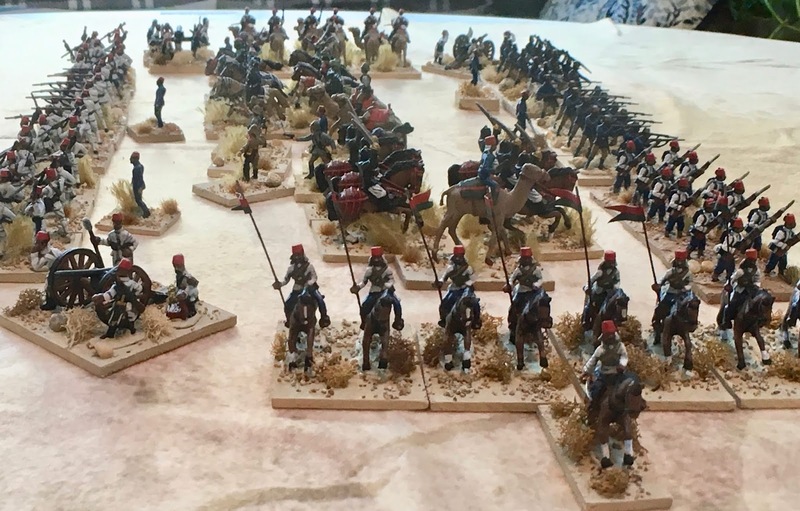 The empty space represents the space where Egyptian units perished. 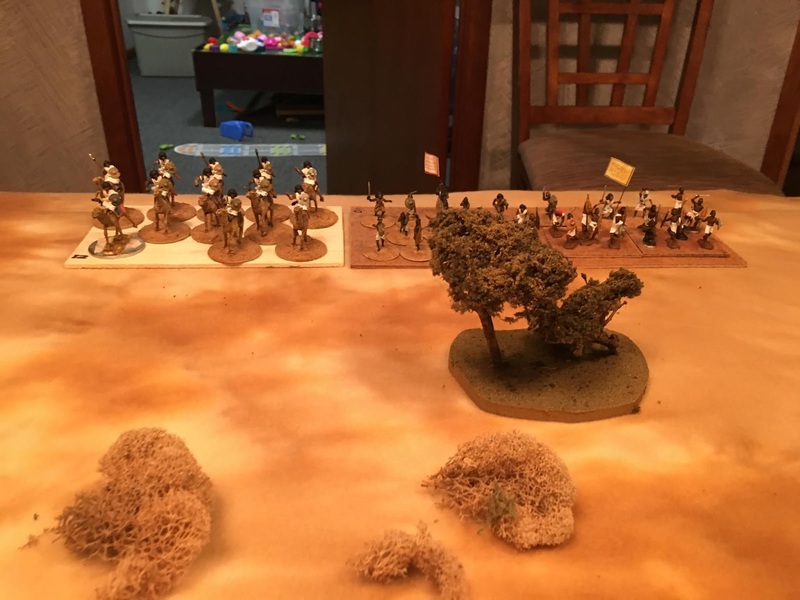 The Blue Flag Rub comes in on the other flank. There is no way out! 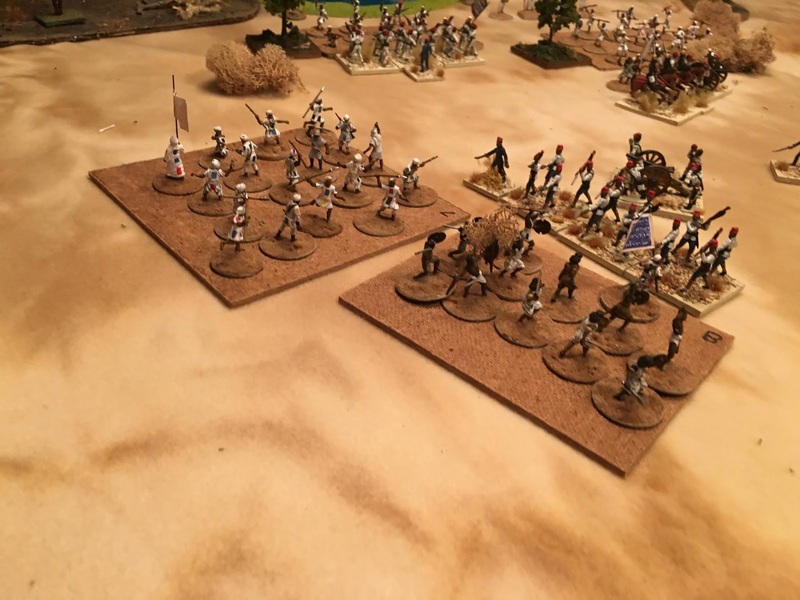 The Black Flag Rub counter attacks against the rapidly crumbling Egyptian lines. This will not go well for the fellahin! It won’t be long to complete the massacre. 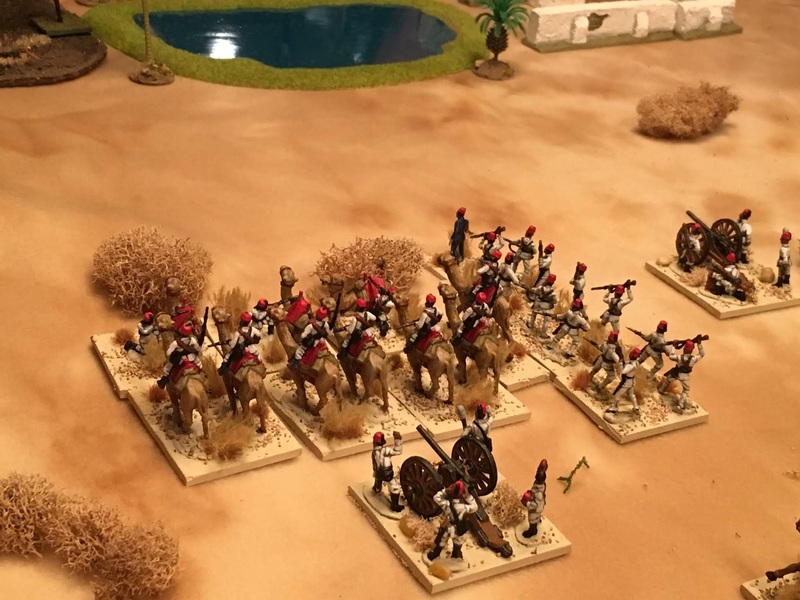 Egyptian Gendarme lancers at the start of the game looking sharp but that won’t save them. 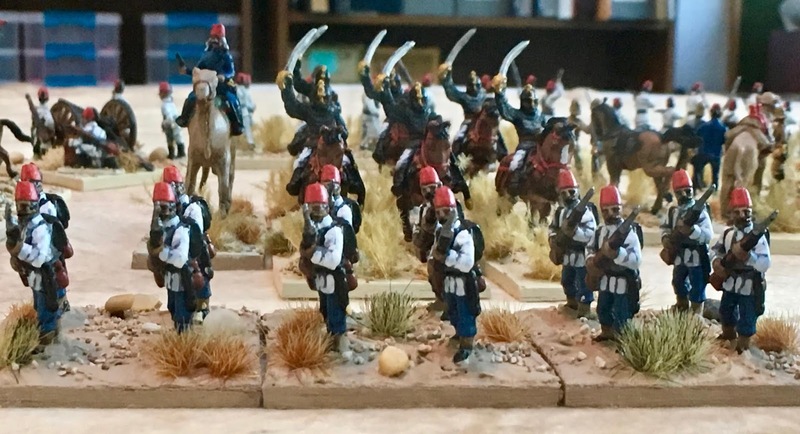 Fellahin at the ready supported by the Khedive’s Cuirassiers. One of the Krupp breechloaders that would prove mostly ineffective. 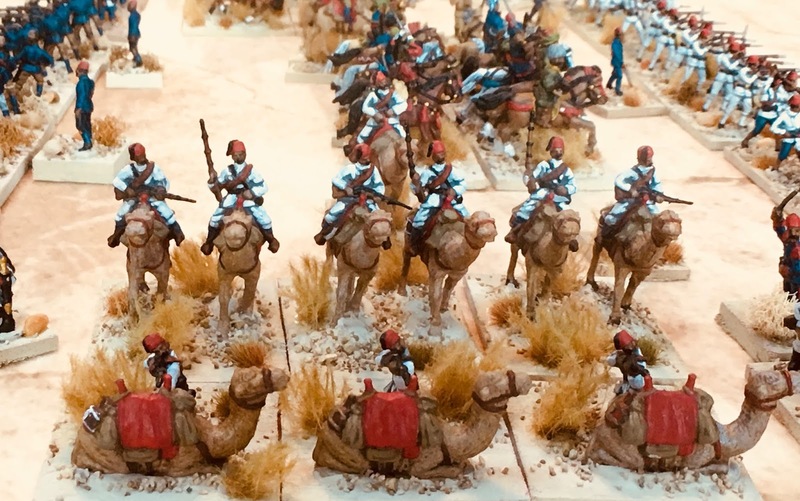 Camel troops are usually mounted infantry in the rules. A smoothbore artillery piece as an anchor. 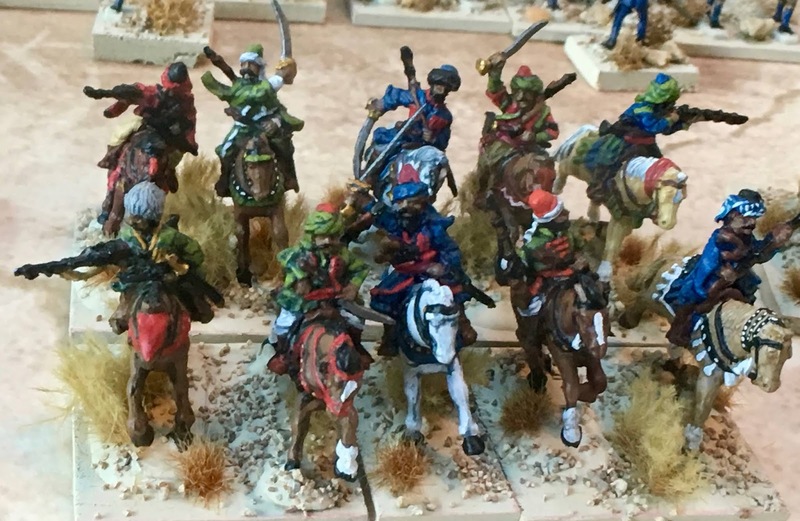 Bashi Bazouks, bandits really. Probably just burned down a village. Hicks and staff ready to die to a man and they would. 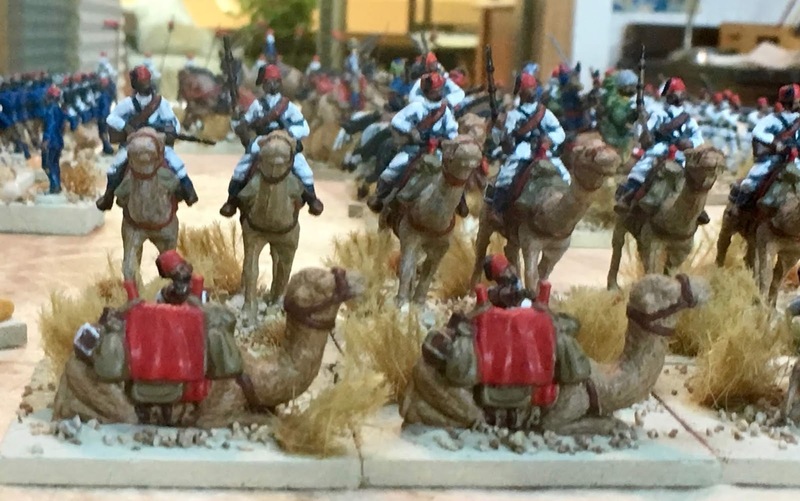 Nice close up of the Egyptian camel corps.